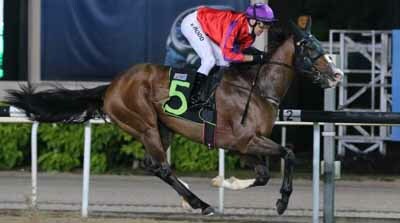 Despite being unplaced in his first six starts in Singapore, DICTON still started favourite in the S$80,000 Seristine Cup over 1600m on the polytrack at Kranji here tonight. Having raced in much tougher company earlier, perhaps it's time for the English gelding who had raced in France and an invitation race in Hong Kong to shine. And shine he did. Partnered by Michael Rodd for the first time in a race (Rodd had only previously ridden him in trials), DICTON came from a long way back to in the Class 3 event to win drawing away by 2 3/4 lengths. DICTON won six races in three seasons in France, including the Group 3 Prix de Fontainebleu at Chantilly and the listed Prix Omnium II at Saint-Cloud. But he was also Group 1-placed twice: third in the French Derby and third in the Poule d'Essai des Poulains. It has taken him a while to find his former self but DICTON should be winning in better company from now on. "We will set him for the Gold Cup. He arrived as a five-year-old stallion and needed gelding," said trainer Cliff Brown. “He just needed racing to get fit and find his rhythm again. He won a very nice race tonight and let’s hope he holds that form."